Note the engine sticking out past the cowling. 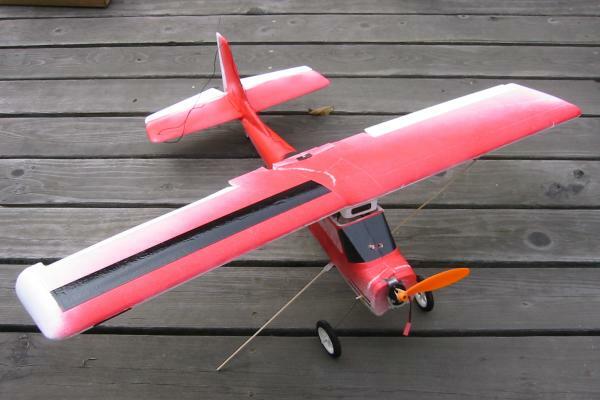 The E-Starter was actually the second plane I bought. But I saw several crashed and miserable examples on the local flying fields and was determined to build mine right and learn to fly adequately before putting it in the air. However, I was already annoyed with the plane. I carefully tried to balance it out using the stock battery compartment, but it simply could not be done. So to get it in the air, I stuck on a Cyrano motor mount, which looked absurd. But it balanced. So of course on my very first flight I had a rough landing. It's better than it looks, though: no damage. I did manage to get it off the field intact! 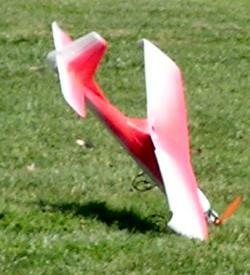 It actually flew pretty well! 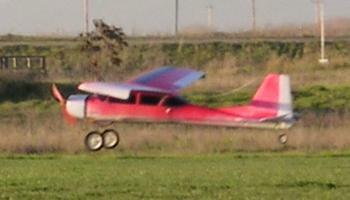 Sedate, easily controlled, and did some simple aerobatics (slow loops and rolls). So I took it home, made a more forward battery holder, put on some tape and window stickers -- then got it some better wheels to cope with the grass. After that I was able to deal with the landings pretty well. Here's a nice approach shot of the final "stock" version. This happened while starting a landing approach. I had been hanging out in a very empty area of sky, and started my approach well behind the main flying area. Nevertheless, someone managed to stray right in front of my plane and I centerpunched it. This was the result, and the end of the Estarter in stock configuration. 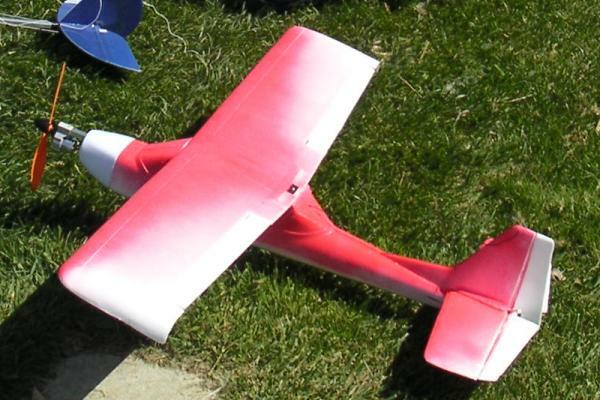 I took it home and shelved it for a couple of weeks, then chopped out all the ruined stuff and made a smaller flat-wing version on which I put a Himax brushless for a short while. The plane was still boring to fly, and the motor made an awful sound. Sold the motor, retired the plane. It's sitting on the back porch now.